Buckeye chickens are a calm dual-purpose chicken that have a decent laying ability (between 150 and 200 eggs per year) and strong meat production characteristics. Buckeyes are yellow skinned chickens that lay brown eggs. They are the only purely American chicken breed to sport a pea comb, and this, combined with its stocky build, makes them a supremely cold-hardy chicken. They also bear some traits of Game fowl in frame and disposition, being assertive in character and a very good forager. Despite their game heritage, they tolerate confinement well, although they will be much happier and produce better if allowed to range on grass. Buckeyes are primarily mahogany red with black tails; sometimes males have other dark feathering. According to the breed standard, a Buckeye's plumage should ideally resemble the hue of an Ohio Buckeye's seeds. 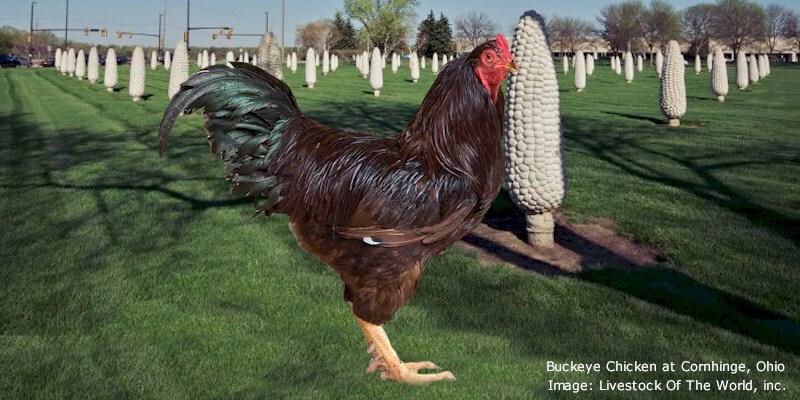 In the past, largely due its lack of color variations, the Buckeye has not been an especially popular exhibition breed.Also they were not adopted by commercial operations so they were generally used on smaller farm flocks. Theis all resulted in the a decline in their numbers. Today there are fewer than 1,000 breeding Buckeye chickens in the United States, with seven or fewer primary breeding flocks, and estimated global population less than 5,000. However, there is a growing interest in the exhibition poultry fancy for this dual-purpose variety of bird. Buckeye males weighs an average of 9 lb (4.1 kg), and the hens 6.5 lb (2.9 kg). They have yellow skin and lays brown eggs. Especially in the hen, the breed is very similar in appearance to the Rhode Island Red. Buckeyes can be differentiated by a bar of slate color on the back feathers close to the body; their body is also much more compact, with a short yet broad back.